James Beard said the only thing that will make a soufflé fall is if it knows you’re afraid of it. I’m afraid of soufflés, and they know it. Also: spaghetti squash, pastries, and anything layered. Poached eggs, too. In my house, you can have your eggs scrambled, hard-boiled, or not at all. I’m even intimidated by certain ingredients and entire sections of the farmers market. You know those people who can just throw a bunch of things in a skillet, and all of a sudden it’s edible? I hate them. I’ve long suffered from a complete lack of culinary instincts, probably due to the fact that my father’s a professional chef. Either cooking skips a generation in my family, or having elaborate meals prepared on demand as a child didn’t exactly instill in me a desire to do the work myself. My one cooking skill is that I know how to read, which actually helps a lot with recipes. Naturally, I married a man who shared my talent for avoiding the kitchen. We were doomed to a life of eating in restaurants and heating up leftovers. For a few years, that was our pattern. Our microwave has seen it all. When restaurant surfing got too expensive, I’d make tuna salad, crock-pot chili, or some other bland dish in my repertoire. I cooked to be practical, and we’d eat dinner sitting on the couch or standing in the kitchen. Those meals weren’t even worth setting the table for—they were just fillers between our brunches and dinners out. My husband and I loved talking about food, discovering new restaurants, and sharing creative meals at other people’s tables. Still do. But I wanted to recreate that feeling at home, and to bring people to my own table. So I decided to stop running from cooking. I pored over food blogs and folded countless corners in cooking magazines. I even got to know the lovely ladies of the Food Network, until it occurred to me that their specialty of shortcutting recipes with packaged and otherwise unhealthy foods is exactly what I was trying to get away from. I tried recipes that were outside of my comfort zone, and even found myself in those scary sections of the farmer’s market, filling my basket with ingredients I couldn’t pronounce. I started taking mental notes at restaurants and asking my favorite chefs and home cooks about technique. I was surprised by my own curiosity. This new interest in cooking, an activity I once dreaded, was turning out to be pretty fun. Fun, but also frustrating. Some meals were victories, and others total flops. I dropped things and overcooked things and blended things a little too long, despite the fact that I was still relying on recipes approximately 100 percent of the time. I told myself that most musicians don’t get their start by sitting at a piano and going to town. They first learn to read music and play songs that other people wrote. Eventually, they don’t have to look at the music anymore. And once they’ve played enough of other people’s material, they start trying out their own combinations of notes and writing their own songs. Recipes are like sheet music, and it takes time to become a composer. You don’t just turn into a good cook overnight. It’s not magic, and you’re not born with it. It’s a process, and ideally, a creative one. For me, cooking used to be about nutrition and practicality. I’d make dinner as quickly as possible, so I could get on with the more pleasant parts of my daily life. There was no point in challenging myself during the 10 or 15 minutes a day I reluctantly spent in the kitchen. But when I started viewing cooking as an exercise in creativity, like writing or making art, a new world slowly opened around me. If cooking is a creative pursuit, then we better cook challenging meals. And why wouldn’t we? There’s so little risk involved; the home kitchen is a safe place to fail. Screw up at work, and you might end up jobless. Screw up in a relationship, and you might end up alone. Screw up on your taxes, and you might end up in a meeting with the IRS. Screw up dinner, and… you might have to order a pizza? If it doesn’t taste good, salvage it. Make something else. Go out to dinner. If it’s overcooked, puree it. If it’s burnt, call it blackened. The risk is low, and the payoff is immeasurable. Don’t get me wrong. Though my relationship with cooking has changed, it still seems harder than it should. Sometimes the mere thought of making dinner hurts my brain, and I’d rather just go to bed hungry. And that’s okay. I don’t cook creatively every night, but those hard-earned meals pay off, and the time between them is slowly closing in. The payoff is simple: when making dinner is a challenge, eating it is an event. The other night I made a soufflé, and it turned out edible. Delicious, even. It filled my stomach and brought me to a table with my husband and our friends, where we talked about important things. When I stood up to clear our plates, I looked down at what I had created, took in the quiet music and conversation in the background, and smiled. Cooking sustains our bodies. And our spirits, if we let it. What a brilliant piece! I’m going to be sharing with friends. 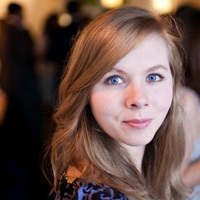 Kate Kiefer Lee is a writer, editor, and content curator at MailChimp. She lives in Atlanta with her giant dog and average-sized husband.